iCloud is a part of Apple's dominant service, but it is only few iPhone users that understand it uses. iCloud storage helps to store information on all your devices in sync. It also allows users to share files from their device to PC. The data on every device is updated automatically to ensure that latest information is available on each device. The service functions wirelessly and runs in the background with no particular action required from their users. Therefore, it’s necessary to know how to access iCloud storage. Firstly, you can make use of any supported website browser to access iCloud storage. You can search for iCloud storage on your computer or make use of your iPhone device to obtain information from the files app. 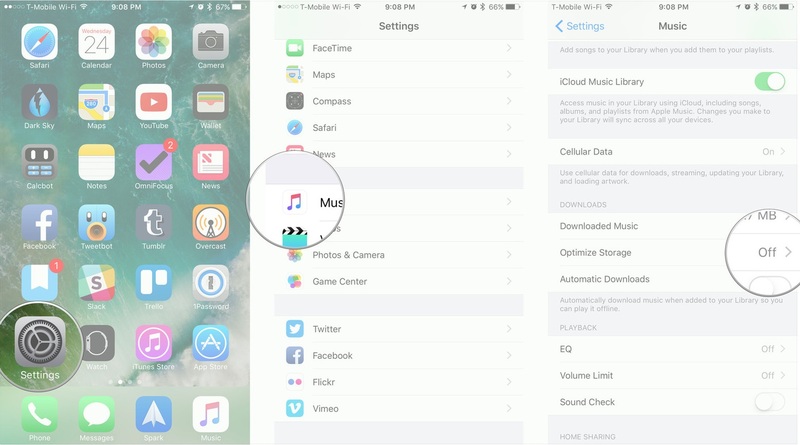 On your computer, you can search for the files on your home screen, under your documents folder search for iCloud. This will help you to find all the files in the desktop folder in iCloud storage. To know how to access iCloud backup is as important as how to access iCloud storage. Because you backup your iPhone device on iCloud, all the necessary data on your device will be backed up automatically. The backup’s files will include your photos, videos and documents. Most apps usually backup files to iCloud automatically when you install them on your device. It is possible to change the apps back up to iCloud and delete previous backups on your storage. Step 5: Select Delete and Turn off. When you click on delete and turn off options, it will switch off iCloud backup for the app and delete all the information from iCloud. You have to delete all the photos and iCloud backups to have access to the iCloud storage on your device. 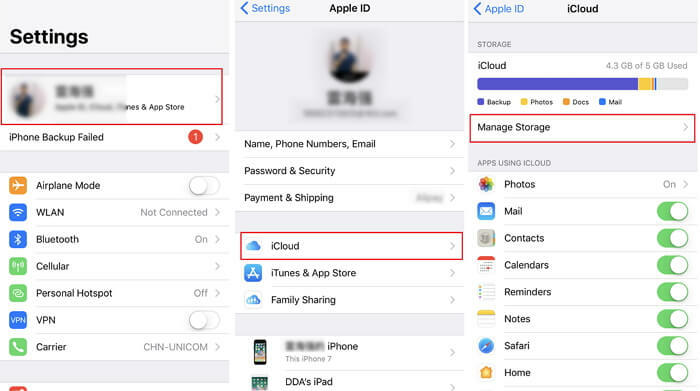 This will help you to control the apps and data types you need to back up on your iCloud account. Type your name in the top corner of the screen and click on iCloud. You will detect the size of your iCloud storage that is used for pictures, documents, backups and app data. Make sure you toggle on and off those apps that are using iCloud including third-party apps. Step 1: Click on “Manage Storage” options. 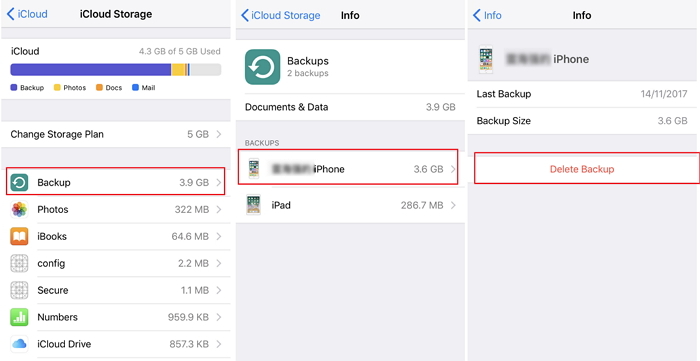 Step 2: Select “Backup options” and delete any backups saved directly on the iCloud storage. Note: If you want to remove a backup on your iOS device, this will switch off backup option on such device. Step 1: Go to the “Manage Storage” options. Step 2: Click on change storage plan. 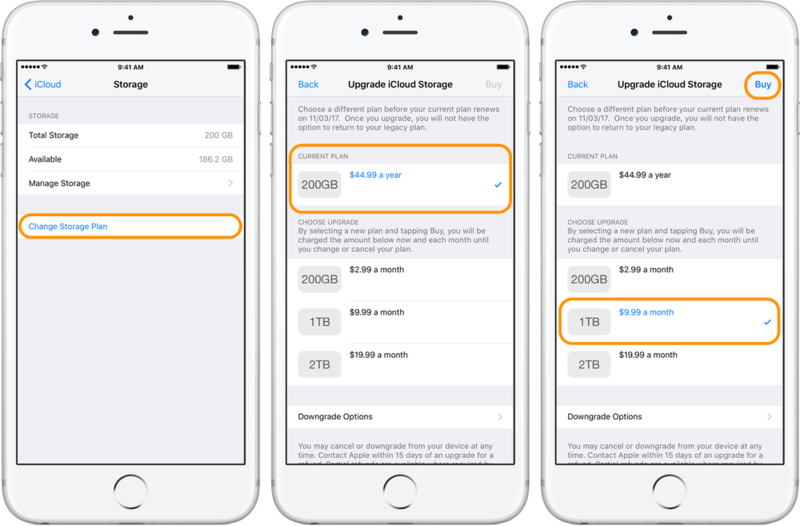 Note: If you didn’t have enough space on the iCloud storage, you could get an Upgrade link. iCloud storage usually stores all your latest videos and photos on your devices. You can create more space in iCloud storage if you delete videos and pictures that you are not using again from the Photos app on your device. Knowing how to free up iCloud storage is more useful than how to access to iCloud storage. You can select the save space option on your iPhone device anytime you want to optimize your device storage settings. When you turn on the optimize storage settings, your pictures will free up space automatically by replacing your videos and photos with device-sized versions. Your original videos and pictures full-resolution are secured on iCloud storage. It is easier to download them anytime. It is possible to use iMyFone Umate Pro to reduce photo or back up files to your computer. You can also delete the same data in iCloud to free space on the iCloud storage. 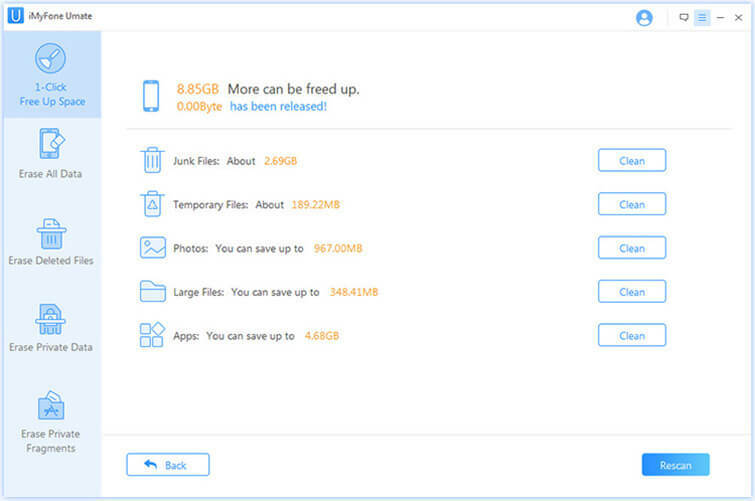 iMyFone Umate Pro for Win or for Mac helps to make more space for new videos and photos. 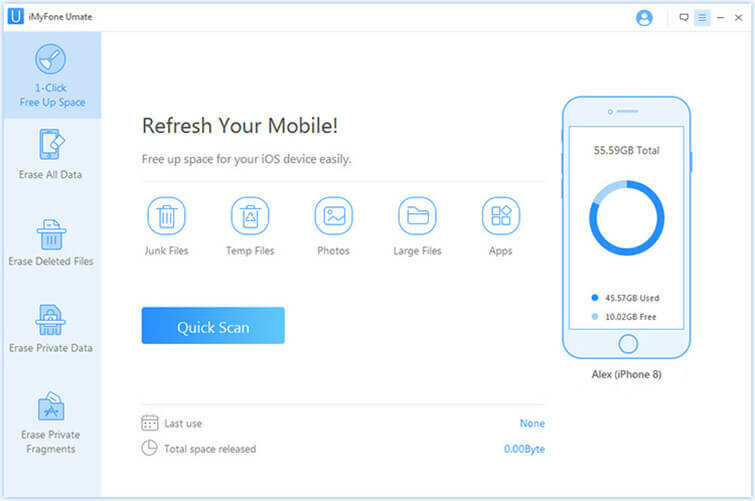 They provide users with the best option to keep their iPhone device clean from junk files, restore storage space and increase users’ device efficiency. iMyFone Umate Pro makes it easy to free space from its home screen interface with a few clicks. Clear off junk files on iPhone device for free. Step 1: Connect and scan your iPhone device. Install the software on your computer. Open it and use a USB cable to connect your iPhone device. Step 2: Scan your device for space-saving analysis. Then, the iMyFone Umate Pro's home screen interface emerge. Step 3: Click on the "Quick scan". The software interface will scan and analyze the data smartly. The full space-saving analysis will clean up junk files, delete temporary files, compress pictures and delete large files. Step 4: Click the "Clean" button beside "Photos", and then choose "Backup & Compress". 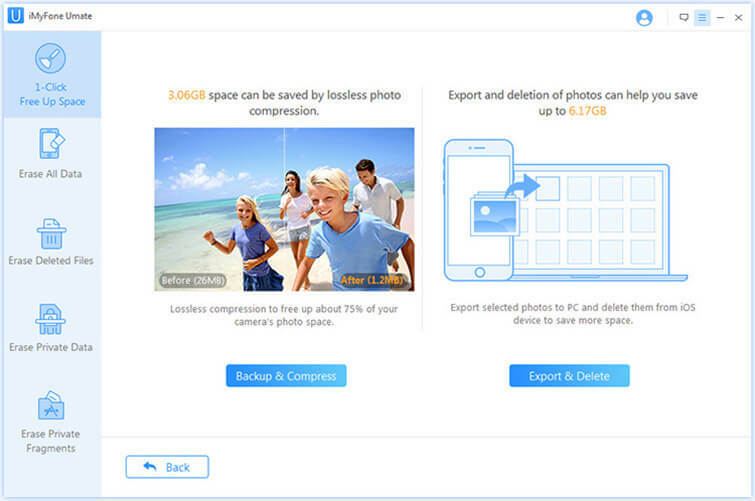 The software will start to compress your photos. Finally, this method will help you to restore space on your iPhone device and also free up your iCloud storage as the photos are compressed and occupy less storage than before.